Last summer, Rob Zombie and Marilyn Manson celebrated their Twins Of Evil North American tour by covering Beatles classic Helter Skelter. The pair decided to collaborate so they could join each other onstage and perform the track during the co-headlining run. 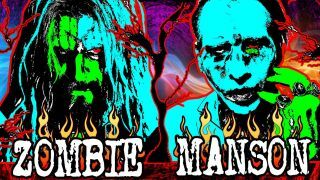 And, with Zombie and Manson preparing to head out on the road together once again, Zombie has called on fans to help choose a track for them to cover this year. Some of the ideas thrown his way so far include Pink Floyd’s Wish You Were Here, Led Zeppelin’s Stairway To Heaven, Radiohead’s Creep, Motley Crue’s Shout At The Devil, and Paint It Black by the Rolling Stones. Whatever they decide to choose, the results are sure to be something pretty special. Watch this space. The Twins Of Evil: Hell Never Dies tour will get under way in Baltimore on July 9. Find a full list of dates below.